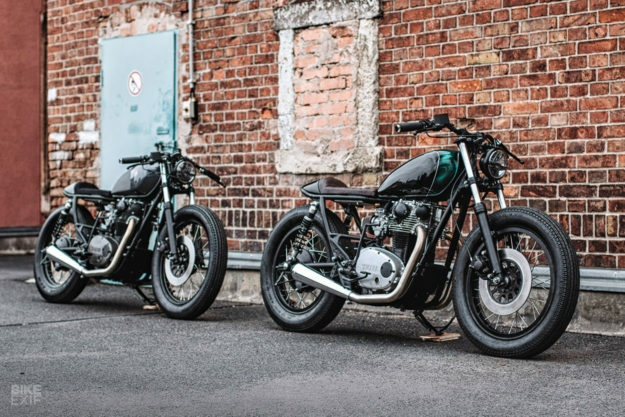 The correct answer to ‘How many bikes?’ is always ‘one more.’ And these two dapper Yamaha XS650s from German wunderkind Nico Mueller and Hookie Co. illustrate the point beautifully. 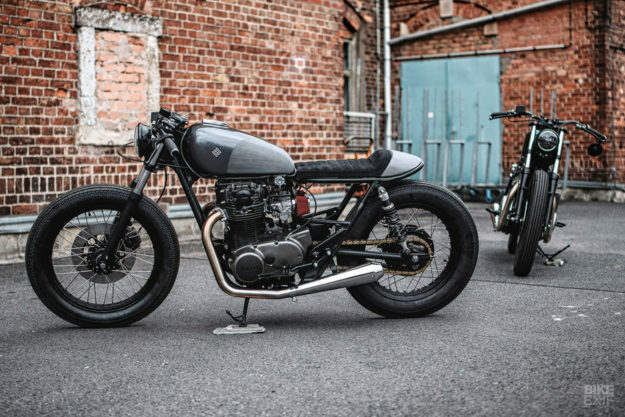 The Dresden-based outfit landed the build commissions from two different sources. But since the briefs came in at almost the same time, and were so similar, the guys decided to tackle them as a pair. Neither donor was in particularly good condition, so Hookie Co. rebuilt both motors and treated them to fresh finishes. The carbs were refurbished too, and re-jetted to run with pod filters. 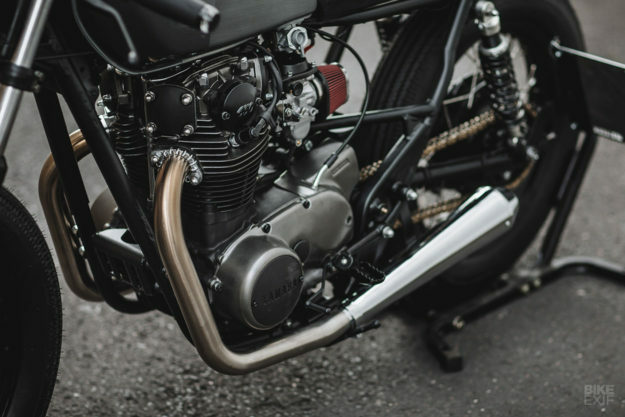 Each bike was then upgraded with a set of stainless steel exhaust headers, terminating in aftermarket reverse cone mufflers. Next it was time to fiddle with the frames. They were stripped, de-tabbed, shortened and looped at the rear, and then coated black. 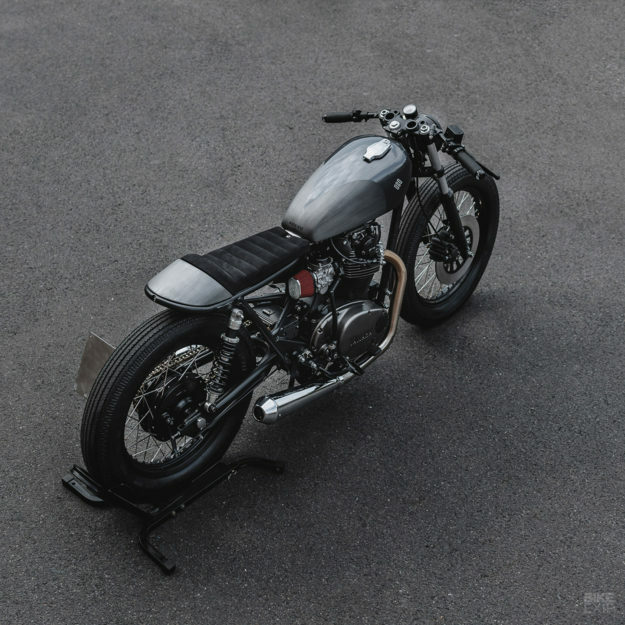 Hookie fabricated a pair of matching bum stops and seats, and embedded a small LED taillight in each rear frame loop. Underneath the seats you’ll find custom-made electronics trays, with the batteries lurking further down, near the swing arm. 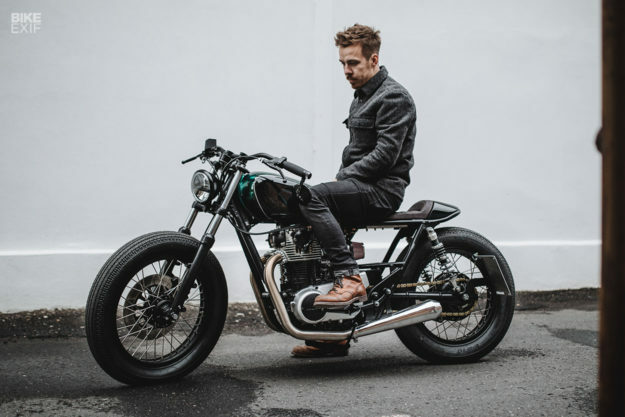 The bikes have naturally been rewired too, and now run Antigravity Lithium-ion batteries, with control units and keyless RFID ignitions from Motogadget. 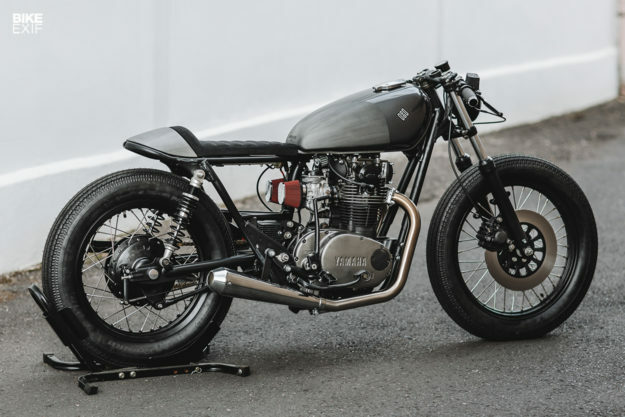 The similarities continue: both XS650s have had their forks rebuilt and lowered 2”, with new YSS Eco-Line shocks fitted out back. The stock hubs have been re-laced to Sun Remo aluminum rims, which are wrapped in Shinko E270 tires. Hookie rebuilt the brakes too, and installed new front master cylinders. 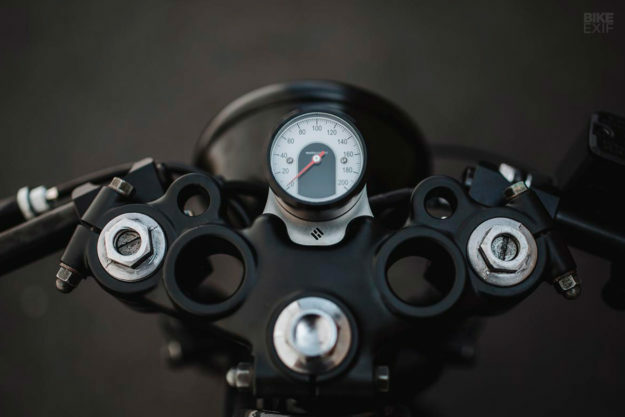 The most apparent change—other than color—is in the handlebar set ups. One wears traditional riser bars, while the other wears clip-ons. 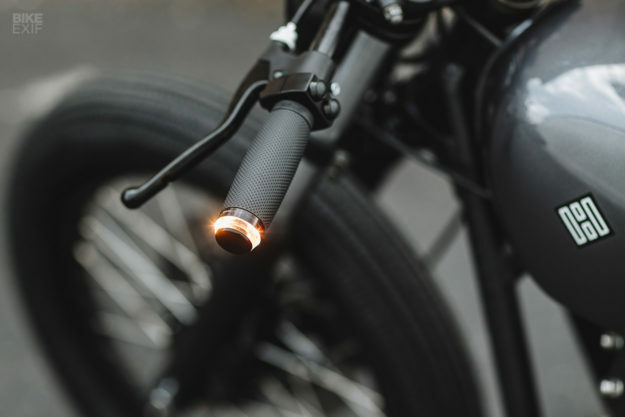 Both feature Biltwell Inc. grips, and Motogadget bar-end turn signals and switches. The speedos are from Motogadget too, and sit on brackets from Hookie’s own aftermarket parts catalog. And yip, the 5 1/2” Bates-style headlights are also a match. 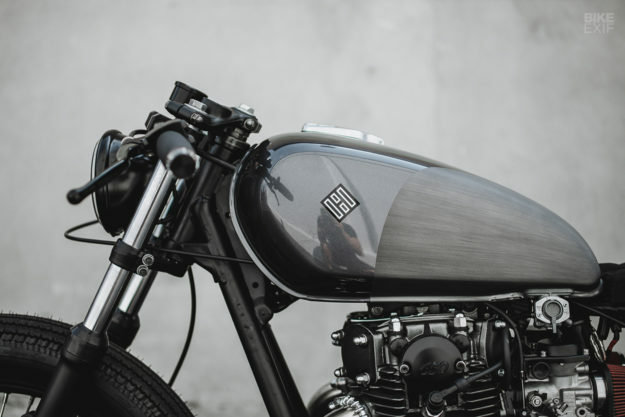 For their makeovers, the stock XS650 tanks were sent off to the well-known German artist Chiko’s Pinstriping. One came back deep and textured, the other one more geometric in nature. A few more subtle touches help refine the concepts. Bengali gets a pop-up gas cap, a brown leather seat, and black and silver finishes on its motor. 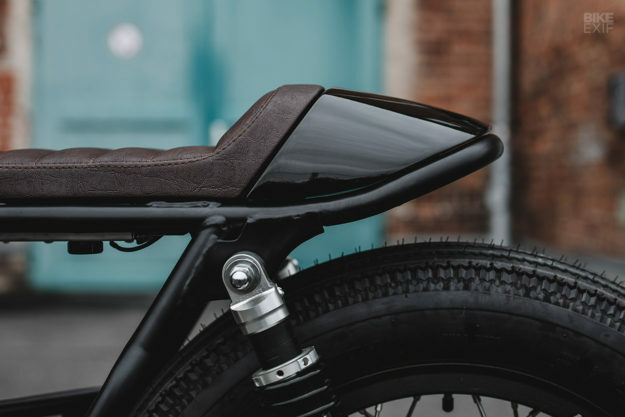 Whippet gets a black Alcantara seat, and a combination of black and anthracite engine finishes. 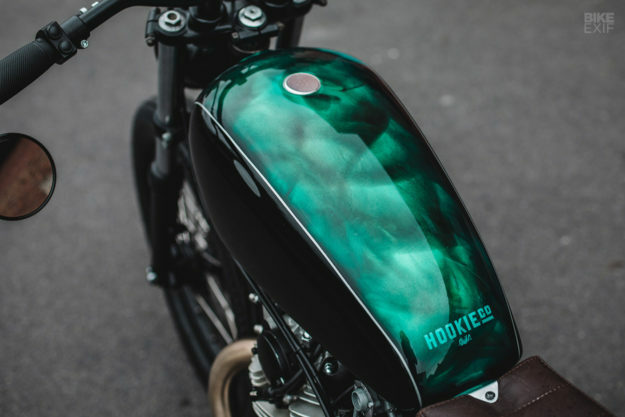 Hookie Co. have proven once again that they have a sharp eye, and a well-honed set of skills. 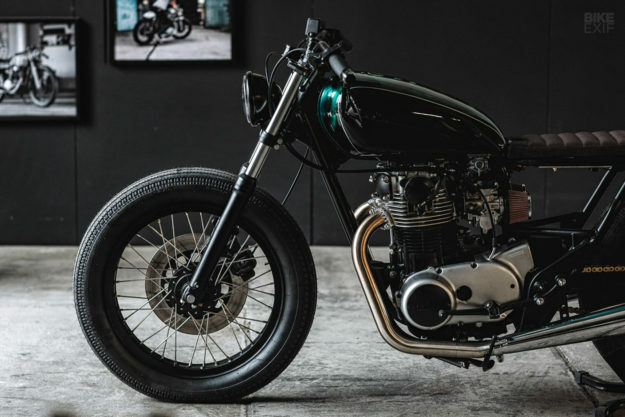 The XS650 wears both outfits extremely well, and we’d be hard-pressed to pick a favorite. How about you: would you take home Bengali, or Whippet?